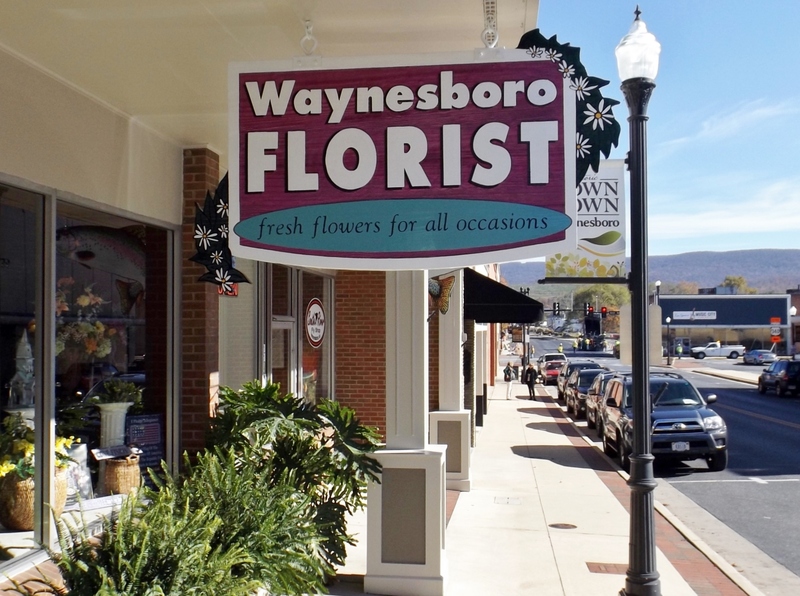 Back in the mid-nineties I created a new sign for Webber Payne, owner of Waynesboro Florist. I used to fabricate all my own cedar and redwood sign panels. Now, being a smaller shop, I sometimes order panels already glued up and ready to route, carve, or sandblast. The three-foot high by five-foot tall wood sign we made for Webber’s shop has served him well over the years. Last month, Webber contracted a painting company to repaint his downtown shop. At that point, he decided to hire me to restore his sign back to its earlier glamour while he was at it. An important feature of well-made cedar and redwood signs is durability: the wood is naturally rot and insect resistant and it holds up for a lifetime of service when regularly maintained. Augusta Sign Company repainted the sign and custom ceiling bracket, carefully restoring the colorful entry sign for another twenty years of faithful service attracting customers into the store! Sometimes sign projects don’t have to be glamorous. Such was the case when I provided a set of dimensional injection-molded plastic wall letters for a local church back in the early 1990’s. The letters are pretty standard– made from a standard mold in a standard plastic color with standard mounting hardware! Although they were basic letters they still had to be custom-fit to the wall in which they were mounted. The manufacturer of the letters on this project is one of the premier letter suppliers in my industry. Chances are, if you order dimensional letters from a local shop, they will come from the same place. An important benefit of using dimensional letters from this supplier is that all their products have a lifetime warranty against breakage, cracking, fading, and so on. Therefore, if you use dimensional letters from Augusta Sign Company for your entrance signage, you are guaranteed to have a long-lasting product! When I owned and operated Tree Street Signs in Crimora I placed many plant entrance signs in service. Back in the 1990’s we made the signs for the DuPont Lycra facility which is no longer there; we made the sign for McKee that still stands; we made the signage at Rental Uniform Service, now Cintas, and we made the corporate entrance signs for Hollister in Stuarts Draft, among many others. 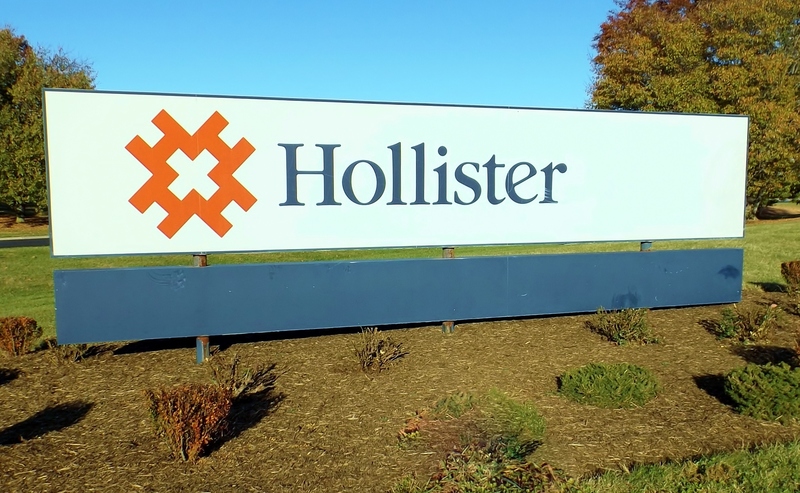 The Hollister signs were made in the mid-90’s and to my knowledge, have not been maintained since. The painted aluminum signs are still doing their job, but they are at the point where restoration should be considered. The architectural metal signs were finished with acrylic enamel, the same paints used for auto finishes, and lettered with high performance 3M vinyl graphics, which have an expected 10-year outdoor lifetime. Needless to say, both the paint and vinyl graphics have outlasted expectations. Augusta Sign Company was born from a company that understood long-term sign construction so you can trust that your signs will be built to last! 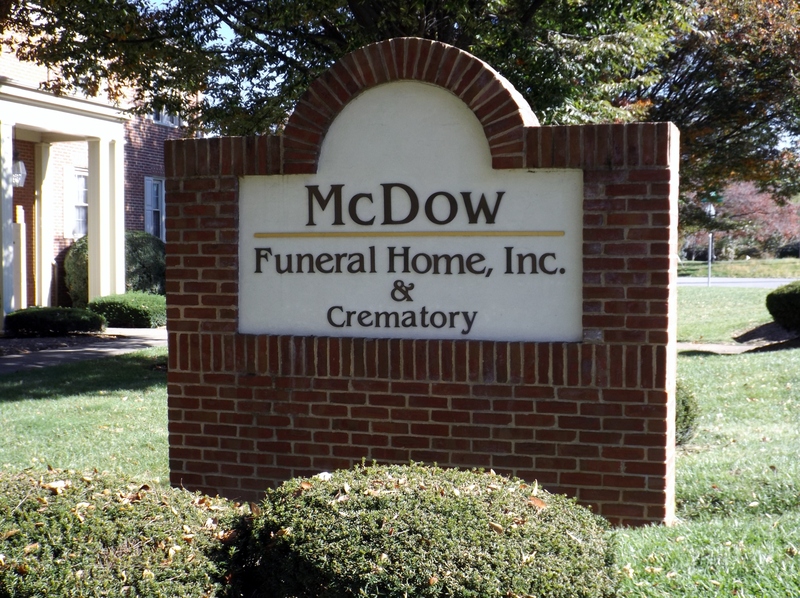 Buried deep beneath the McDow Funeral Home sign is a cache of extra brick that matches the sign. The buyer, now deceased, Tim McDow, requested that the brick be buried to ensure a good match if they ever decided to expand the sign later. The sign, constructed in the early nineties, still looks great! I provided minimal maintanence in 2011 when the organization added a crematory and I updated the lettering and painted the stucco to refresh the sign background. With training in architectural design, I offer a level of design service that other local competitors may not be capable to do. I enjoy working with customers and local masons to come up with long-lasting aesthetic sign designs. It may sound weird, but I am confident that many of the sign structures I have made will outlast me here on this earth. Maybe that’s why we call them monument signs! Wood signs make great options for churches. They look nice and last a very long time when proper materials are utilized. 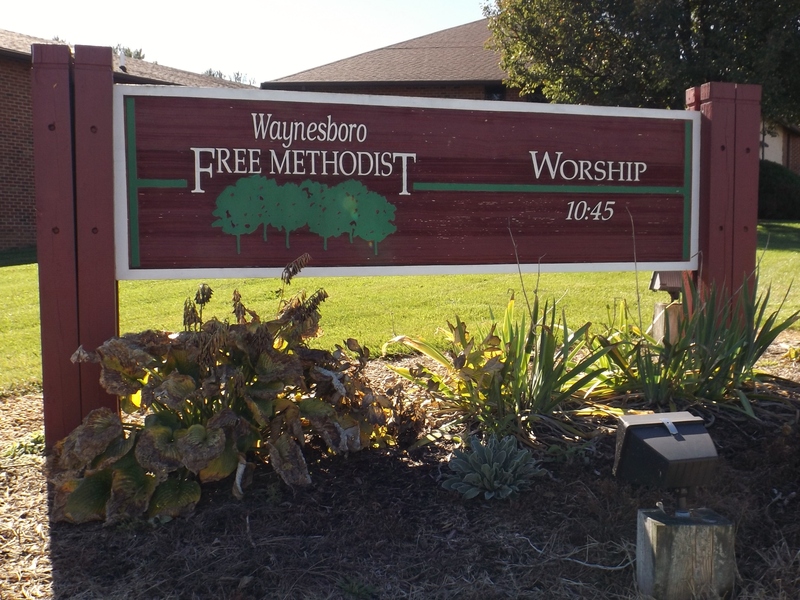 The sign I built for the Waynesboro Free Methodist Church was one of the first redwood signs I put in place. Not long after taking a week-long sign-building workshop in Vermont, I began building quality custom wood signs around Waynesboro and the Shenandoah Valley. And these signs still stand to this day, a living testament of their quality. The long, monolithic, horizontal sign design was something I patterned to the looks of signage I had begun to build for Wintergreen Resort in the early 1990’s. These types of sign designs are easy to light and look great in colorful landscaping beds. This sign has been well-maintained by church members. 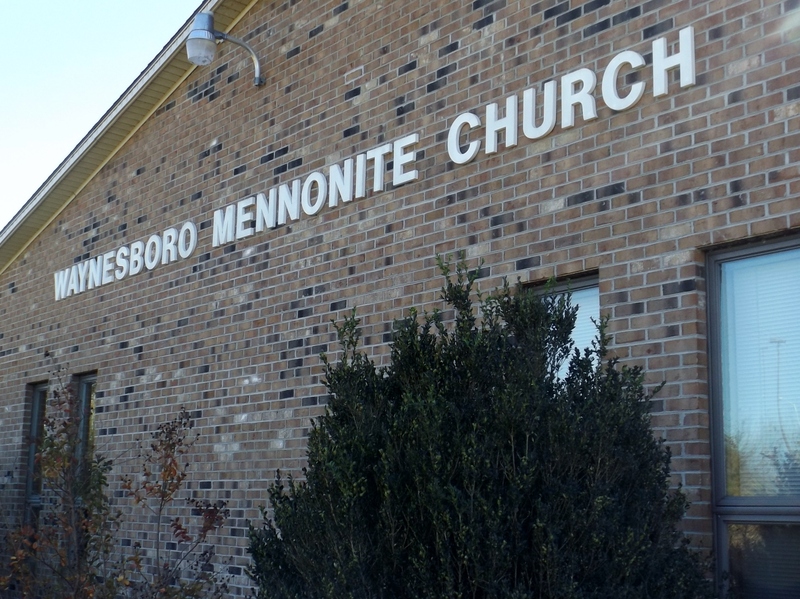 The location of this particular sign at a busy intersection has gotten loads of attention over the past 25 years and I hope it has helped attract new members and visitors to the church! Unique sign shapes and typefaces add eye-appeal to signs. 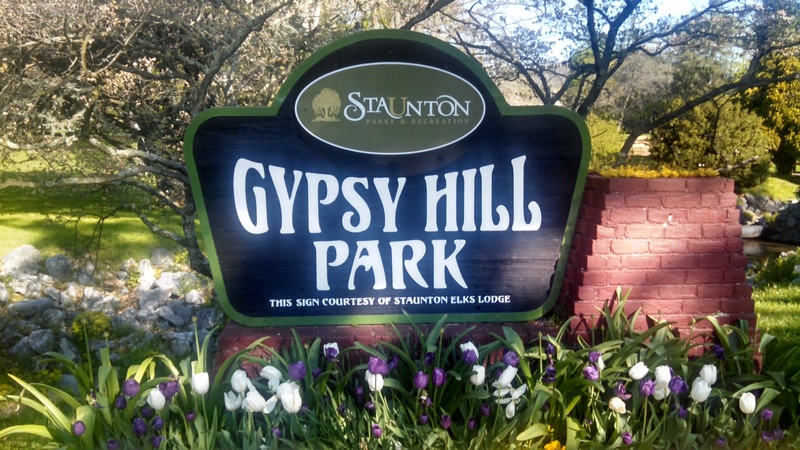 Back in the early 1990’s I had the opportunity to help design the signage for Gypsy Hill Park, and later helped with Montgomery Hall Park which used a similar design theme. Steve DeVenny, Superintendent of Parks and Recreation, hired me to make the signs originally. A few years ago, Steve hired me again to maintain and update the signs. The City changed logos so we came up with a way to add the new logo to existing signs by fabricating painted metal ovals that covered the old dimensional lettering while providing a background for the new brand. After twenty years, the old signs were battered and mildewed, but after restoration they were as good as new. I treated the surfaces with bleach before repainting and used a two-part epoxy to fill big defects. The project involved multiple signs and I took great care to make sure colors were consistent on all the signs throughout the two parks. I believe the signs are good for another twenty years. I wonder if Steve and I will be around the next time maintenance is required? Only time will tell. Mark Hackley owns and operates Augusta Sign Company in Waynesboro, was founder of Tree Street Signs of Crimora in the 1990’s, and served as an account representative for Holiday Signs of Chester. He began his sign career as a civil servant in the Department of Defense, learning the trade at the National Naval Medical Center and Andrews Air Force Base in Maryland. How Long Do Cedar Signs Last? Sandblasting, carving and routing are three ways that cedar wood can be fabricated into rugged and durable exterior signage for businesses, churches and other not-for-profits. Cedar and a few other American softwoods and exotic woods like redwood and mahogany, are the best choices for outdoor wood signs. Painted aluminum signs are also a great choice for outdoor signs if your don’t mind the commercial look and feel, but for neat three-dimensional images that are the best for downtown areas and certain industry-specific applications like retirement centers, parks and recreation sites, churches, schools, and medical offices, I believe finished wood signs are the way to go! Sandblasted Cedar Sign produced in the 1990’s for the City of Staunton’s Parks and Recreation Department still looks great today after only one maintenance performed at a 15-20 year interval. So how long should cedar signs last? First let’s talk about sign fabrication methods so you are comparing apples to apples when considering a sign’s lifetime. At Augusta Sign Company we use 1 1/2″ to 2″ thick cedar boards laminated edge-to edge. Each board is from 3″ to 7″ wide, no wider, since cupping can be a concern for wider boards. When I build a sign panel I use West System Epoxy, a durable and tested adhesive used in the ship building industry for years, so it can be trusted if correctly applied. Make sure that when the boards are being laminated that the clamping pressure is just right…too much pressure can squeeze the glue out of the joints, weakening the sign panel structure. Whether the letters are carved or blasted into the panel, or if the background is gouged out leaving raised graphics, has no real bearing on longevity, except that you probably should pay a little attention to thin details in letter characters, such as in script or serif fonts, since sometimes these can break off over time. One big consideration is the final finish. Sandblasted backgrounds should always be stained versus painted. Stains do not peel over time and they bring out the character of the interesting wood grains in the sign. I recommend using a stain consisting of 50% Bulletin Color and 50% Penetrol for backgrounds. Any flat lettering, edges, borders, and unlettered backs can be primed with a durable oil based primer like Zinsser Brand, and then finished with either oil based bulletin paint or quality latex paint. 23K gold leaf is great if used sparingly in a sign. Gold is a precious metal so it will outlast any stain or paint. It is not necessary to clear coat a sign if the proper finish materials are used. A clear coat will only last a minimal amount of time before needing re-coating, and the UV protection from something clear just can’t help protect the wood any more than the solid color finish below, in my way of thinking. I think it’s a waste of time and money unless you need abrasion protection like on vehicle lettering or signage in a high traffic area where there’s lots of opportunities for people to mess with the sign. After all this, how long can one expect a cedar sign to last? The cedar itself will last your lifetime as long as no one hits it with a mower, a tree doesn’t fall on it, or a car doesn’t run into it. But you can expect the finish to last an average of 10 years under normal conditions. So as long as you put your sign on a 10-year maintenance cycle, and nothing weird happens like a tornado or accident, it will last forever, at least from your point of view!